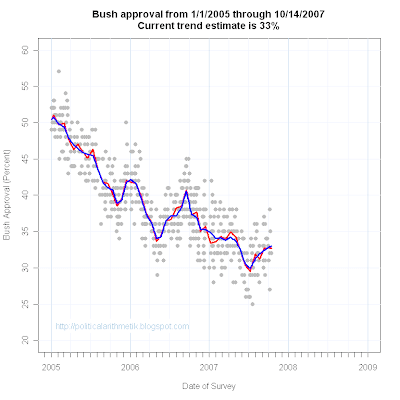 President Bush's approval trend has been relatively flat in recent weeks. 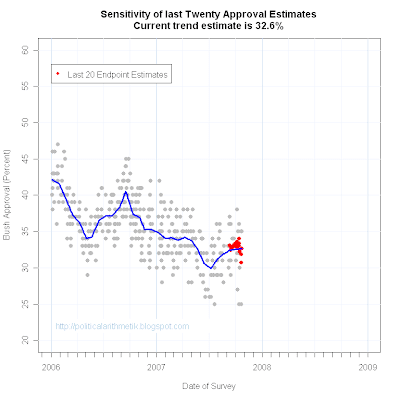 For the last month the estimated approval has held between 32% and 33% and currently stands at 33.0%, which includes Gallup's 32% approval from polling done 10/12-14/07. There was a fairly sharp upturn that started in July, which has tapered off but not yet disappeared. Poll to poll fluctuations have pulled the trend estimate around a bit in the 32%-33% range but without clear evidence of significant change. 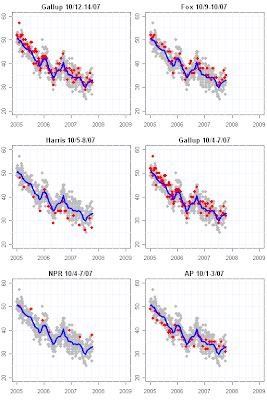 The last six polls also demonstrate some persistent differences between polls. The NPR Poll, conducted by Public Opinion Strategies (R) and Greenberg Quinlan Rosner (D) has a persistent positive house effect, making NPR one of the higher measures of Bush approval. 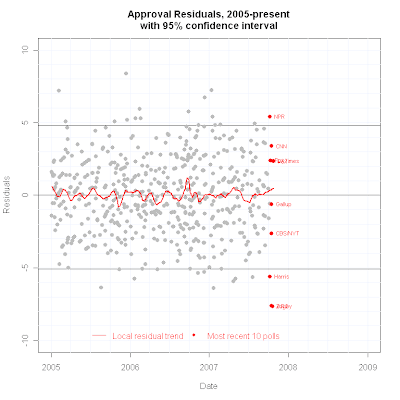 In the opposite direction, Harris has a persistently negative reading of approval. 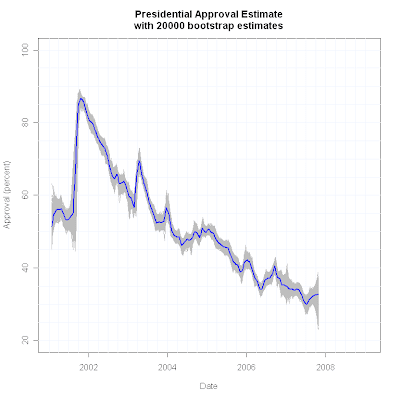 In the figure below, we see that both are outliers in the current approval trend. But this is a good example of when being an "outlier" doesn't necessarily mean anything is wrong with the polling. NPR samples "likely voters" and we know from other analysis that samples of likely voters are generally more approving of President Bush. Likewise, Harris (along with Zogby) uses a four point approval scale, "Excellent", "Good", "Fair" and "Poor" while everyone else uses "Approve" or "Disapprove". Harris and Zogby (and me) arbitrarily map "excellent" and "good" into "approve", and "fair" and "poor" into "disapprove". But is that the right way to make different answers comparable? Do the first two of these choices mean exactly what "approve" means? No. This is just the best categorization possible for mapping these four response options into two. And one consequence is that Harris and Zogby tend to come in below the estimated trend. The choices these polling organizations make to sample likely voters rather than adults, or to use a four choice approval measure, are not in any sense "wrong" decisions. But they do mean that the results these pollsters get will be somewhat different from what others, using different samples and different questions, will find. But the choices DO make these polls more likely to be "far" away from the trend which is based on all pollsters. So why call them outliers? Simply because they are, in fact, well away from the trend and the distribution of everyone else. In some cases that might indicate a "bad" poll, a sample that for some reason is far from what we would normally expect, or perhaps a biased question wording or sequence of questions. But being an outlier can also result from making choices of sample or question or other procedures which are different from most. Different yes, not necessarily bad. But different is surprising, nonetheless. My goal here is to put everyone's polling in perspective, and these two do deserve to be labeled "outliers" because they are in fact different. A normal reader of polls without benefit of the perspective we provide here, would reasonably ask how can NPR get Bush at 38% and Harris have him at 27% (and the trend estimator be at 33%?) That surprise factor is also part of what being an outlier means. Without some further explanation (sample, question wording) the results appear puzzling. An outlier may be understandable or explicable, as both of these appear to be. Or in may not. 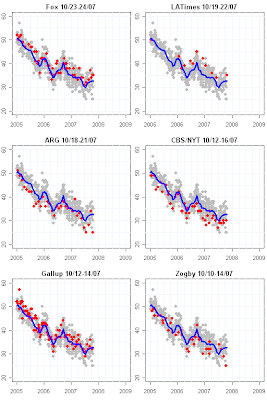 Either way outlier detection draws attention and asks for an explanation or a discounting of the finding.